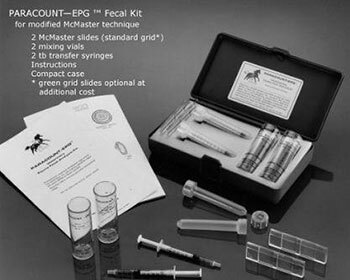 This kit includes components to determine a quantitative Egg Per Gram (EPG) count in grazing animals and ruminants utilizing a modified McMaster egg counting technique. An EPG quantitative analysis is generally accepted as more accurate and meaningful than a simple qualitative approach. The kit performs a quick quantitative faecal test for an EPG, also the most accurate indication of parasite paddock or pasture contamination, which in turn leads to reinfection in the animal. An effective parasite control program can be based on quantitative faecal analysis. The Paracount-EPG™ test is simple and quick. A faecal sample is mixed in volumetric proportion in a calibrated vial with flotation solution. An aliquot is then transferred to our specialized counting slide which is observed microscopically at 100X. Eggs within the slide’s grids are counted, a multiple factor applied, and the EPG determined. The test demonstrates eggs normally recovered by flotation, including the eggs of S. vulgaris, S. edentatus, small strongyles, and Parascaris equorum. Additional equipment necessary is a microscope with 10 x 10 for total 100X power and a mechanical stage, and a commercial flotation solution.